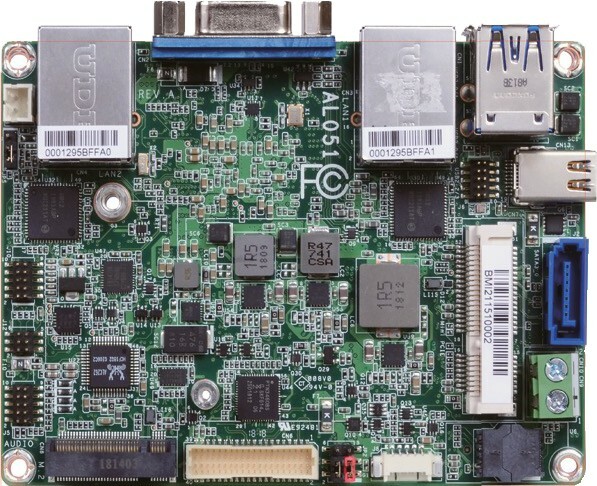 The ALD051 is a Pico-ITX fanless industrial PC-board measuring just 100mm by 72mm which makes it ideally suited to space-limited applications with diverse I/O requirements. The 6th generation Apollo Lake series CPU, including N3350, and N4200, plus the Atom x7-E3950 Apollo Lake, x5-E3940 and x5-E3930, offering low power operation and enhanced graphics. The ALD051 uses industrial-grade components to ensure exceptional quality, a long product lifecycle and product endurance. With a SODIMM socket for up to 8GB DDR3L 1866MHz RAM, a powerful, IoT-ready industrial PC system can be realized by adding 3G/4G modem as well as an SSD using the available full-size miniPCIe and M.2 B key 2242 sockets. 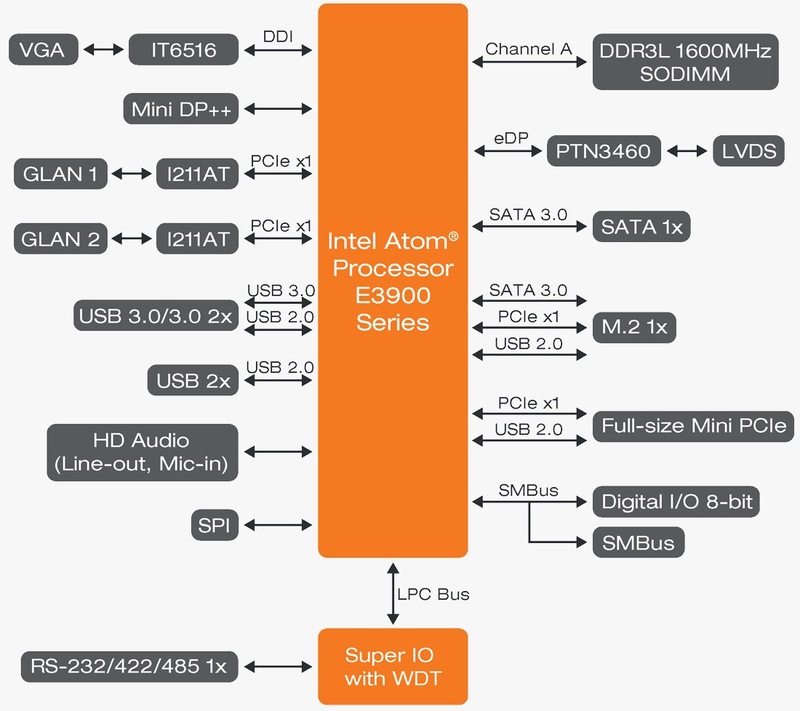 Up to 3 displays are supported via VGA, miniDP++ and LVDS. Dual Gigabit Ethernet, 4 USB ports including dual USB 3.0, RS-232/485, SATA 3.0, SMBus, audio and GPIO are all available. For industrial applications, the ALD051 is available in extended (-20C to +70C) and full industrial (-40C to +85C) temperature specification. 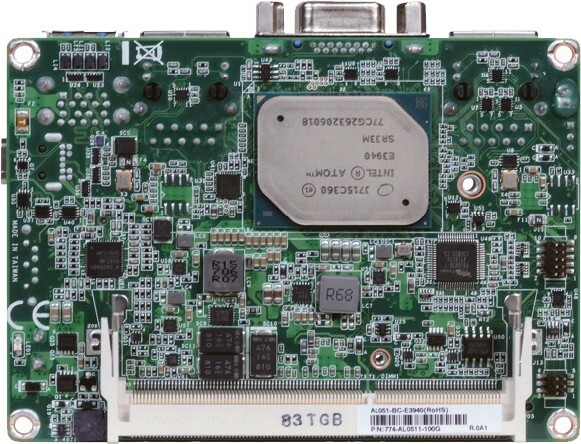 The board features 12v single supply as standard. A wide supply voltage (9-36v) version is available. This product can be supplied with Windows 10 IoT Enterprise “Entry”, with a licence cost under £40, while preserving full Windows 10 functionality. Ethernet 1000 BaseT 2* Intel I211AT Gigabit 2x RJ-45. As well as desktop Windows 10, the ALD051 supports Windows 10 IoT Enterprise. As well as providing additional features for securing and debranding industrial products, the “IoT Enterprise” version of Windows 10 offers LTSB functionality so that automatic updating doesn’t potentially interfere with repeatable operation. This product also qualifies for the “Entry” licensing level which means that Windows 10 licenses can be considerably less than 50% of the usual cost. Our Windows Embedded specialists can help you to create custom images to take advantage of the embedded enabling features of Windows 10 IoT, allowing you to create a locked-down, reliable, non-windows-branded, small footprint image. The ALD051 is readily available with Atom x7-E3950, x5-E3940, x5-E3930 and Celeron N3350 processors, in commercial temperature spec. Additionally, the ALD051 equipped with x5-E3930 is available in both extended and full industrial (-40C to +85C) temperature spec. Other combinations, including N4200, on request. We can also offer Windows Embedded licenses, and assistance in configuring Windows Embedded images. If you have questions, including pricing and availability, please don’t hesitate to contact us by calling Direct Insight on +44 1295 768800 9am to 5.30pm UK time, emailing info at directinsight.co.uk, or by using the forms to the right.